The owners of a number of luxury flats have been asked to leave their homes after cracks appeared in the walls, BBC Scotland has learned. The developer has asked to take possession of the prestigious properties on Dundee's waterfront to investigate the problems. 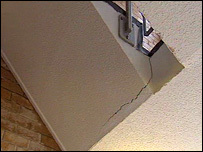 Residents said further cracks had been appearing on a daily basis. 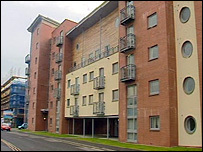 However, AWG Property Ltd insisted there were no health and safety issues with the apartments. In a letter to residents, the firm's director said "there may be some issues with the fabric of some of the properties" at City Quay. David Pople added: "In order to ascertain the exact nature of these issues, it will be necessary to undertake a detailed structural investigation of the flats in your stairwell as a precautionary measure. "Therefore, we regret to inform you that it may be necessary to take possession of your property for a time to facilitate a thorough investigation of the building." Resident Robert Lowe, who works in the construction industry, said he was "distraught" and "very concerned" at the content of the letter. He told BBC Scotland the problems in his block started about four months ago and had recently got worse. He said : "Internally, there's cracking on the stairwells; there's windows moving, where they're not able to close properly; there's doors opening when they should be remaining shut. "On the exterior, there is quite substantial cracking appearing daily." Mr Lowe and a number of his neighbours have taken legal advice over the matter. Russell Miller, from the Institution of Civil Engineers, said residents at City Quay had cause to be "reasonably concerned" about the problems with the buildings. He said: "In the early stages of the life of a building, the foundations do bed into place, and you will get minor cracking. "You can also get cracking as a result of the building expanding and contracting, but if the cracking is ongoing and is getting worse, then it's something that needs to be looked at." He added that it was generally "unusual" for a developer to ask residents to leave their properties for standard remedial work. A spokesman for AWG Property said residents had been asked to vacate their properties so they would not be inconvenienced by any repair work. He said: "We can categorically state there are no health and safety issues whatsoever associated with City Quay in Dundee. "As a responsible developer, we contacted a number of residents to inform them we may need to examine their properties on a purely precautionary basis. "Our engineers can confirm that any cracking previously examined in individual properties and currently visible on the stairwell are localised and will be dealt with through an ongoing maintenance programme as is common with many new build properties."